Long before "danger" was a book for boys, there was The American Boy's Handy Book by Daniel Beard—a beloved classic by one of the original founders of the Boy Scouts of America. 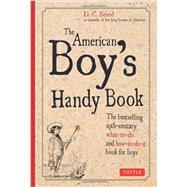 The American Boy's Handy Book was designed to provide hundreds of activities for restless young boys—adventures and games, indoors and out, in every season of the year. It was originally published in 1882 and became an instant bestseller. Daniel Beard, a founding member of the Boy Scouts of America, firmly believed in letting boys make their own playthings with their hands, to encourage them to value their own work and gain skills needed to invent, construct and dream successfully. This is truer today than ever before—in a world of video games and cell phones. Welcome the joys of childhood back into your children's lives with The American Boy's Handy Book, and help them discover hobbies, games and activities that will stimulate their imagination and create a sense of adventure in the real world around us. Daniel Beard was born in 1850 and lived most of his life in Kentucky. He was a prolific writer, illustrator, the founder of two different societies for boys and one of the original founding members of the Boy Scouts of America. Before his death in 1941, Beard received the only Golden Eagle badge ever awarded for his work from the Boy Scouts of America, and had the mountain peak adjoining Mt. McKinley in Alaska named in his honor.